The legal profession is under constant scrutiny; client events, seminars and proceedings before the supreme courts are frequently reported in the media. Law journals and business magazines regularly publish rankings of lawyers and law firms. In view of the strict duty of confidentiality imposed on us as attorneys, however, any information relating to our clients or cases will be published only subject to the respective client’s explicit prior consent. Recently published news and press releases regarding our firm and our services in German can be found here. The international tax journal International Tax Review (ITR) has recently published its annual "World Tax Ranking". 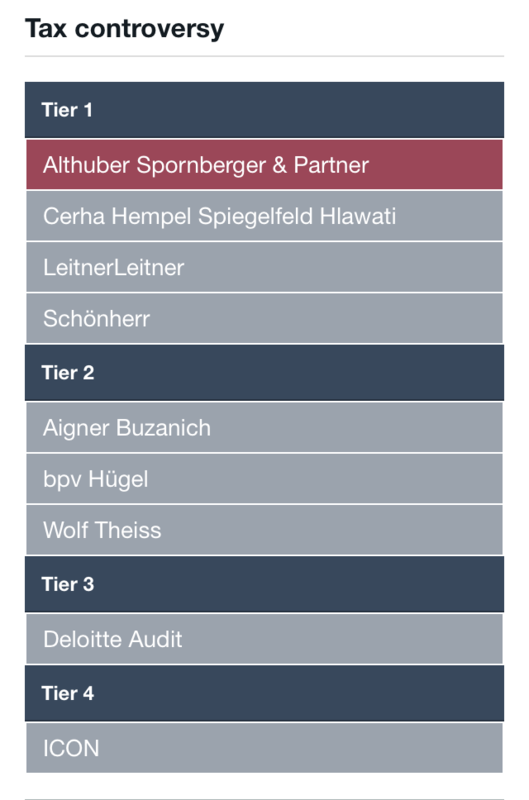 ALTHUBER SPORNBERGER & PARTNER has been recognized as Austria's leading law firm in the field of tax controversy. Franz Althuber, founding partner of the law firm ALTHUBER SPORNBERGER & PARTNERS, is listed in the current issue of the renowned industry magazine WhosWhoLegal as a leading advisor in the field of tax controversy.